A drama about love at the end of life, Amour is an unblinking view of the slow descent into the big sleep. In Paris, firefighters break into a locked apartment and find an elderly woman passed away on the bed, surrounded by flowers. The rest of the film is one long flashback. 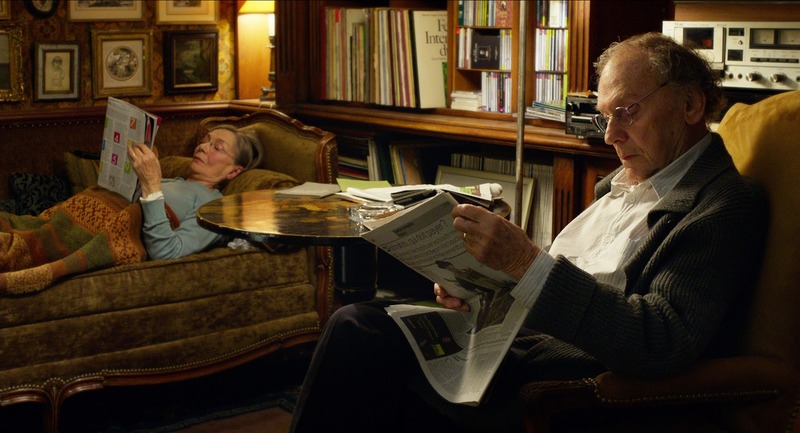 Georges and Anne (Jean-Louis Trintignant and Emmanuelle Riva) are a retired couple living in the apartment, both former piano teachers. Soon after attending a concert by one of Anne former students, she suffers a stroke. An operation to unblock an artery goes wrong and Anne is left paralyzed on one side. Anne makes Georges promise to never take her back to the hospital. With Anne confined to a wheelchair, Georges becomes her full-time caregiver. Their daughter Eva (Isabelle Huppert) is an occasional visitor, and she struggles to come to terms with what her parents are going through. Anne expresses her wishes to die, but then suffers another stroke and is bedridden, barely able to communicate. Georges seeks the help of in-home nurses, as the physical and emotional burden on him escalates. While many films look at couples falling in love at the early stages of a relationship, Amour settles down at the other end of couplehood. With their careers behind them and their children now adults, Georges and Anne are in their darkening twilight, still deeply in love and now having to deal with what it means for life to seep away. This is a deeply affecting film tackling an often ignored subject, at a stage in the human journey where the remaining options are limited and exceptionally challenging. Director Michael Haneke wrote the film based on personal family experience and does not hurry any of the events or actions. He sets up his cameras in static positions and allows the drama to unfold in exceptionally long takes, saturating the screen with gravity and emotion, most of the film taking place in the spacious Parisian apartment. Time passes slowly in the world of Georges and Anne. Shuffling from room to room is an ordeal, transitioning from wheelchair to chair is an achievement. The cameras watch patiently, intruding onto the couple's privacy without judgment but with inescapable intensity as the bond between Georges and Anne is repeatedly tested. Jean-Louis Trintignant and Emmanuelle Riva, 82 and 84 years old respectively, deliver stunning performances. Trintignant is all stoic resilience as Georges navigates around the reality that his partner is ebbing away. Riva has a longer journey in her portrayal of Anne, a proud woman sensing the end and doing her best to exert a level of control, but then held captive by her body's sequential failure. 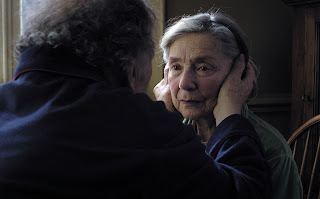 A few events that mark Anne's deterioration happen off-screen, but for the most part, Amour is unflinching. With cold efficiency Haneke invades Anne's most intimate humiliations as she loses the ability to physically look after herself. Her descent into the finality of death is harrowing, and as the end draws near, love is the only survivor. I thought it was brilliant, and while "harrowing" is a great word for it, I think it's the best movie of its year. Emmanuelle Riva was my choice for Best Actress for 2012 as well.